A manned mission to Mars poses a long list of concerns related to physiological and psychological well-being. Scientists know that food is, in a large sense, the ultimate determinant of survivability in a foreign and hostile environment. But how will the spaceflight crew ensure they receive adequate nutrition with taste to boot in long duration exploration missions? “The variety and acceptability of the food system is critical to maintain adequate consumption,” says Dr. Grace Douglas, a project lead at the Johnson Space Center in Houston for NASA’s Advanced Food Technology Project. 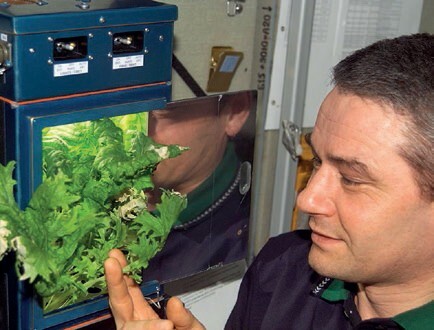 “Ensuring the variety and acceptability of the food over the long duration of these missions is just as important to nutritional maintenance as providing stable nutrition in the food itself.” That means finding ways to provide the astronauts not only with food that has a little pizzazz, but also with efficient methods of food production that minimize crew time and reduce stress. Space food researchers have delved into the concepts of home-cooking, bioregeneration, and astrogardening to develop a system that’s sustainable, affordable, efficient, and transportable. In 2013, six researchers gathered together in a Mars-simulated environment known as the HI-SEAS (Hawaii Space Exploration Analog and Simulation) dome on an abandoned lava field in Hawaii. They conducted a variety of experiments related to sleep, hygiene, and robotic companionship, but their main purpose was to see how home cooking would impact astronaut morale and nutrition. “The study provided an opportunity to bring together a number of key questions in food system design for space life support,” says Cornell University associate professor Dr. Jean Hunter, one of the study’s key investigators. “Are crew members happier with the convenience of prepackaged foods or the creative opportunities of cooking for themselves? How exactly is food quality related to mood? What are the costs and inefficiencies of a crew-cooked food system?”Hunter and co-investigator Dr. Kim Binsted of the University of Hawai’i at Manoa designed the study based on the premise that Mars gravity is one-third of Earth’s and can hold things in place for food prep, like mixing and cutting. The crew was provided with hundreds of boxes of shelfstable ingredients and pre-packaged meals, meaning that on the no-cooking days, they ate like any regular astronaut would. 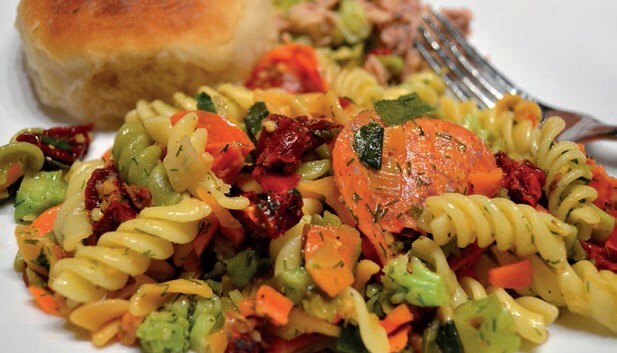 The six researchers derived cooking inspiration from their ethnic backgrounds and submissions from a publicly announced HI-SEAS recipe contest. Winning entries included a “spam’n’egg baowich” (with “baos” referring to Chinese rehydrated vegetables and some Mexican spices), and “dark matter cake” (using coffee, cocoa powder, and mayo). Although hands-on tasks are known to engage and uplift the human spirit, cooking on Mars may produce a negative or neutral effect over time. After all, passion and excitement for an activity fades fast when its sense of novelty is replaced with necessity. Additionally, cooking on Mars presents another issue: no easy resupply. That said, according to NASA food scientist Dr. Charles Bourland, astronauts on the International Space Station use a menu to skirt the problem of food shortage. “They have a pantry up on the space station so they can get whatever they want. We didn’t ever believe that would work,” he said. But, it has. “They plan the food based on a menu and they apparently follow that menu somewhat, but they don’t ever run out of anything.” Something similar could easily be done on Mars. The best bet, Hunter suggests, is to rely on a hybrid food system based on a combination of prepackaged foods, shelfstable ingredients, and greenhouse-grown foods, although the ultimate solution likely will boil down to costs. An amusing feature on HI-SEAS from DNews. Scientist Dr. Raymond Wheeler believes that in time, bioregeneration can sustain large crops for long duration missions. He’s even not too hesitant to suggest the possibility of “growing” other edible life forms, too, like fish. “The gravity on Mars greatly simplifies things. Water runs downhill, heat rises, animals can stand up, fish can swim normally,” he says, adding that bringing animals into space could help reduce inedible food waste. That said, engineering a perfectly-fitting protective goat suit may still be a century off. As it stands now, silkworms have been considered, mainly by Chinese and Japanese scientists, as a promising means to fertilize plants while providing astronauts with substantial animal protein. The challenge here is self-evident, at least for American astronauts. It all comes back to those cultural preferences. Home-cooked silkworm stew with ginger, anyone? Before the Mars crew ingests anything like goat milk or silkworms, scientists first must tackle the challenges associated with growing edible plants. This means recognizing and understanding plant physiology — like changes in root growth and nutrient uptake — in microgravity. It also means addressing issues like lighting and temperature. In 2009, University of Florida’s Dr. Anna-Lisa Paul and colleague Dr. Robert Ferl studied mouse-ear cress in detail and came across an encouraging find: that even without gravity to guide them, the plant’s roots in space grow in the direction that maximizes nutrient availability and uptake. 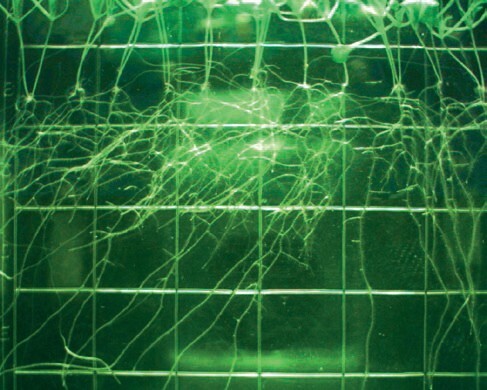 For decades, scientists have thought that a certain feature of root growth known as “skewing” — a growth behavior plants use to navigate obstacles on Earth — was dependent on gravity, as suggested by countless experiments of growing plants on slanted surfaces whose roots skewed left or right, not directly along the surface. The skewing data help illustrate the fact that plants can grow normally with almost zero gravity, and this supports the notion that plants will do “just fine” on Mars, where gravity is one-third of Earth’s. Currently, NASA is funding a Vegetable Production System project, or VEGGIE. VEGGIE is a 7 kg chamber about the size of a microwave oven used for lettuce, cabbage, peas, and other vegetables. NASA plans to send the system to the ISS later this year. The system relies on light provided from multicolored LEDs and draws in ambient air to cool the chamber and supply the plants with carbon dioxide. The intent of the project was to create a very simple low cost system capable of growing edible plants in space. Wheeler also served as the NASA liaison for another low cost growth chamber, Lada, developed by the Space Dynamics Laboratory (SDL) at Utah State University Research Foundation in cooperation with the Russian Institute of Biomedical Problems. First used in 2002, the Lada chamber has grown crops of peas, mizuna, tomato, radish, and wheat. A Globe Trendy video about VEGGIE. The plants are frozen and carried back to Earth to test for any signs of harmful bacteria and physiological and genetic stress. “The Russians have certified Lada grown veggies for consumption; the US has not,” says Bingham, explaining that the US is hesitant to label the plants as safe because some microorganisms in space have been known to become more virulent. 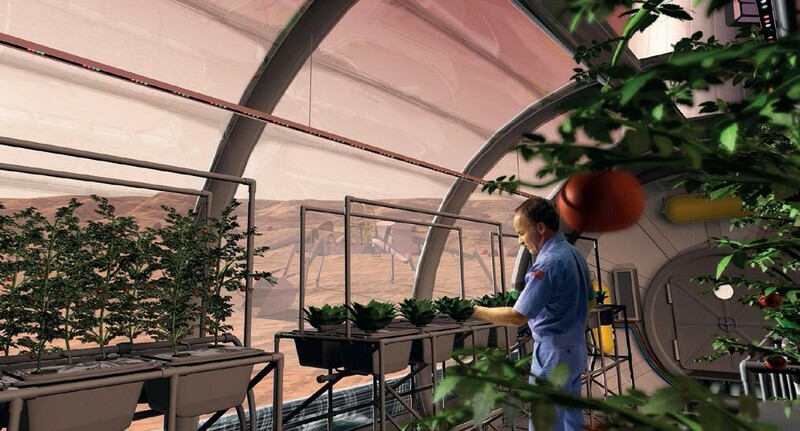 Mars greenhouses could capitalize on natural light instead of LEDs, but that would result in direct exposure to radiation from the sun or solar storms, requiring astronauts to suit up every time they tended to the plants. Because of these logistical issues, scientists have also entertained the idea of using “farmer robots.” As one example, ESA is engaged in the design and development of a human-like mechanical arm that could one day provide crop surveillance, cutting of leaves and weeds, progressive harvesting, transport of crops to storage sites, and more. The Phoenix Mars Lander mission has already determined that Martian soil has a pH and salt content similar to that of Earth’s, even though the nitrogen content is remarkably lower. It has also detected perchlorates — chemicals toxic to humans — widespread in the soil. Some scientists are optimistic there is a work around. The base question, perchlorates aside, is whether or not Mars soil could actually produce plants. Netherlands scientist Dr. Wager Wamelink has been one of the first to study NASA supplied artificial Mars soil (composed of sand taken from a Hawaiian volcano) in a controlled environment. 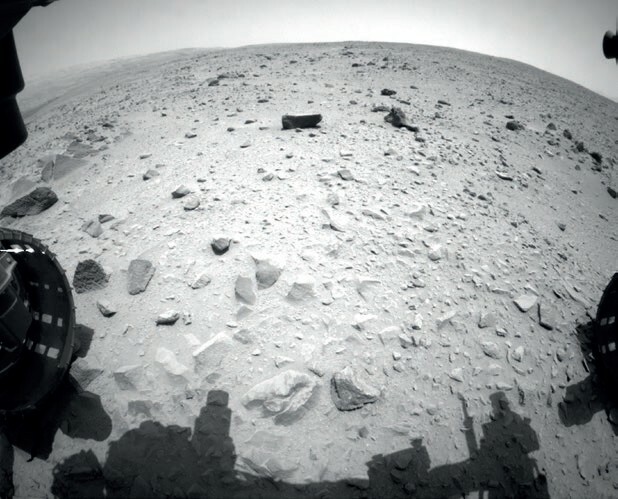 He found that plant species germinated on the Mars soil, but growth thereafter was stunted. Fresh foods definitely offer an improvement to the current space meals and will likely be a requirement, not a perk, to future Mars habitation. Combining the fresh foods with prepackaged ingredients over a stove top could bring a rare sense of satisfaction in the desolate Mars landscape. Scientists still have decades’ worth of research to conduct and not just for the purpose of settling Mars. This article first appeared in the Winter 2014 issue of Space Safety Magazine. 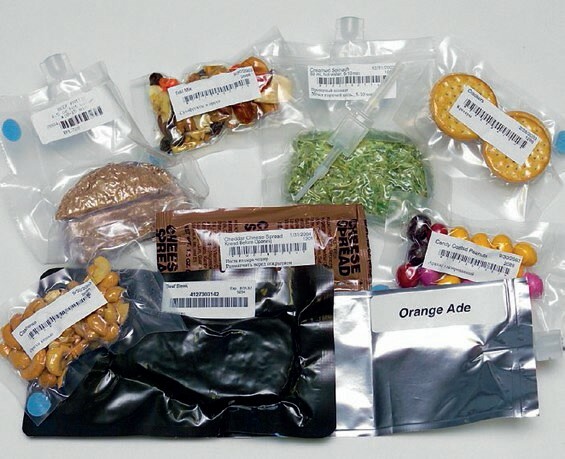 Read more about the future of space food in the Space Food Special Report.